There are two types of conductivity. Thermal conductivity is a measure of how well a material conducts heat. Electrical conductivity expresses how well a substance conducts electricity. A diamond has characteristic thermal and electrical conductivity that can be used to help distinguish it from other materials and identify impurities in a genuine diamond. Most diamonds are extremely efficient thermal conductors, but electrical insulators. Diamond conducts heat well as a result of the strong covalent bonds between carbon atoms in a diamond crystal. The thermal conductivity of natural diamond is around 22 W/(cm·K), which makes the diamond five times better at conducting heat than copper. 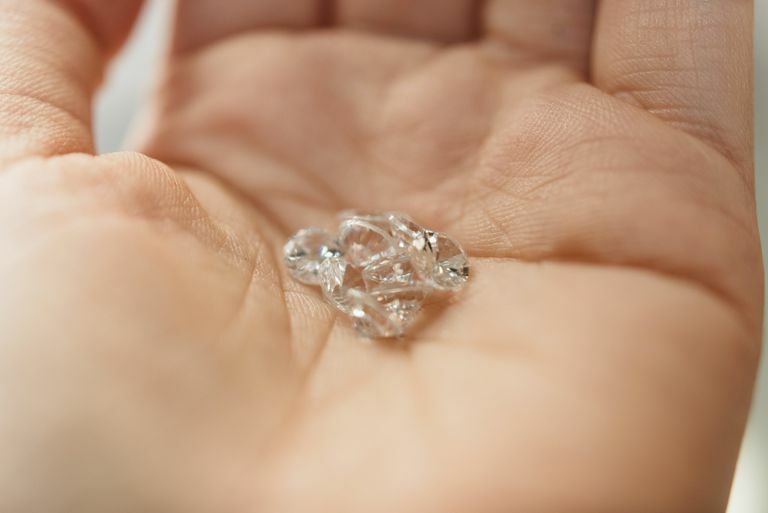 The high thermal conductivity may be used to distinguish diamond from cubic zirconia and glass. Moissanite, a crystalline form of silicon carbide that resembles diamond, has a comparable thermal conductivity. Modern thermal probes can differentiate between diamond and moissanite, as moissanite has gained popularity. The electrical resistivity of most diamonds is on the order of 1011 to 1018 Ω·m. The exception is natural blue diamond, which gets its color from boron impurities that also make it a semiconductor. Synthetic diamonds doped with boron also are p-type semiconductors. Boron-doped diamond may become a superconductor when cooled below 4 K. However, certain natural blue-grey diamonds that contain hydrogen are not semiconductors. Phosphorus-doped diamonds films, produced by chemical vapor deposition, are n-type semiconductors. Alternating boron-doped and phosphorus-doped layers produce p-n junctions and may be used to produce ultraviolet emitting light emitting diodes (LEDs).